To better understand the key challenges and concerns facing audit committees, boards, and their companies, KPMG’s Audit Committee Institute surveyed more than 800 audit committee members in 42 countries. 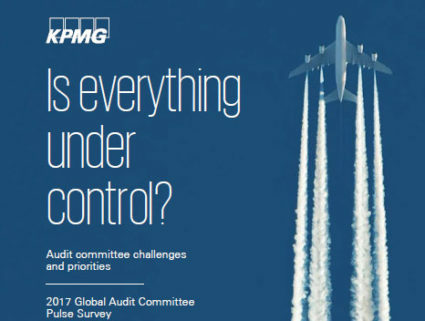 While audit committees continue to express confidence in financial reporting and audit quality, the results highlight ongoing concerns about risk management, legal and regulatory compliance, cyber security risk, and managing the control environment in the company’s extended organization. Risk management is a top concern for audit committees. Internal audit can maximize its value to the organization by focusing on key areas of risk and the adequacy of the company’s risk management processes generally. Tone at the top, culture, and short-termism are major challenges—and may need more attention. CFO succession planning and bench strength in the finance organization continue to be weak spots. Two key financial reporting issues may need a more prominent place on audit committee agendas: Implementation of new accounting standards and non-GAAP financial measures. Audit committee effectiveness hinges on understanding the business. https://kpmglearninghub.com/wp-content/uploads/2017/04/is-everything-under-control.jpg 352 466 hussain https://kpmglearninghub.com/wp-content/uploads/2017/06/cert-logo.jpg hussain2017-01-01 10:25:582017-07-12 14:44:38Is Everything Under Control?